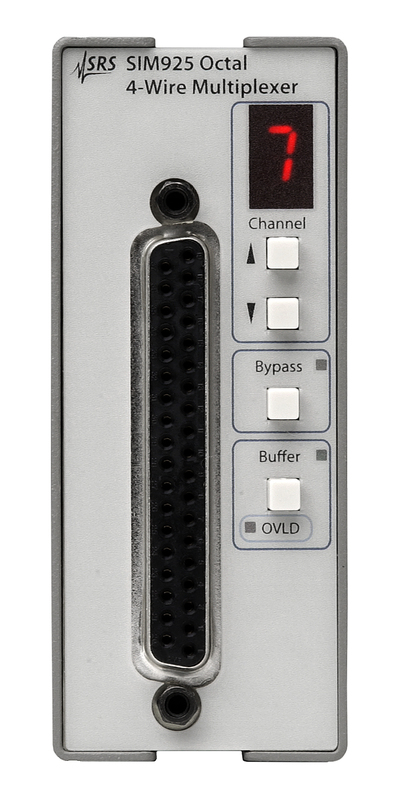 The SIM925 is an eight input channel, four-wire multiplexer for low-level signal applications. Kelvin-lead measurements are supported with optional buffering of the two sense leads. The buffer can be switched out to form a simple relay-based, 4-pole/8-throw switch. Multiple modules may be cascaded allowing unlimited networking possibilities. The digital control circuitry in the SIM925 is designed with a special clock-stopping architecture in which the microcontroller is turned on only when switch settings are being changed. This guarantees that no digital noise contaminates low-level analog signals. Settings may be changed from the front panel or through the remote interface. The multiplexer settings can also be queried. If armed, the module generates a status signal to alert the user of an overload condition. The SIM925 can be operated outside the SIM mainframe by powering it with its required DC voltages. The SIM925 may be used directly with the SIM921 AC Resistance Bridge, SIM922A Diode Monitor, or SIM923A RTD Monitor to read many temperature sensors. It may also be used to route multiple signal sources to a lock-in amplifier, thus automating signal recovery tasks. Input capacitance <60 pF on selected channel, between any 2 leads or ground. <25 pF on selected to unselected channel, any 2 leads. <25 pF on unselected channels.